Enjoy The Poconos while vacationing at The Bear’s Den! This 3-bedroom 2-bath sleeps up to 8 people. This vacation destination is located in Arrowhead Lake Community and is a short drive to the lake, heated pools, tennis, clubhouse, and area attractions! Summer at Arrowhead Lake is memorable at The Bear’s Den! In the winter months this rental is ideal because of its close proximity to Jack Frost & Big Boulder Ski Resort! Find yourself warming up by the fireplace after a long day of skiing! This home is warm & comfortable for a small family or couple retreat! 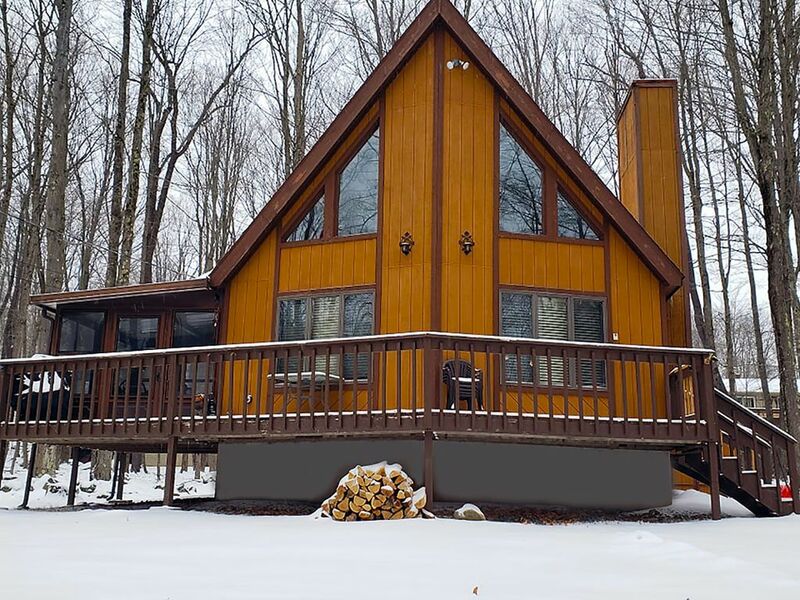 The Bear’s Den is an all you need rental to provide a local experience in The Pocono Mountains! As you step into this 1220 square-foot home you notice the living room is open and leads into an enclosed patio! This rental provides fun and entertaining for the entire family! This rental is PET friendly so you can bring your entire family! rental comes with a fully equipped kitchen! The kitchen is connected to the living room and with a variety of appliances and fully stocked, you can show off your cooking skills to friends and family! Enjoy healthy and home cooked meals on vacation! There is a spacious and open deck great for summer or winter BBQ! Enjoy your summer favorites, hot dogs, burgers, and steak while surrounded by serene sounds of nature at The Bear's Den! This rental comes with high speed WIFI, fire pit, outdoor patio, large front deck, and tons of summer fun down at Arrowhead Lake! You will “FALL” In Love with The Poconos During September, October, and November! The unique blend of reds, yellows, and oranges make for scenic photo opportunities during this time of year. In the summer, as you step out onto the back deck there is a grill to BBQ juicy summer burgers, hot dogs, and more summer favorites! Enjoy the relaxing summer nights with friends and family with the scenic ambiance of Ski Home. All summer rentals include amenity badges to the lake and pool making summer vacations relaxing and fun and you don’t even have to leave the community! Cozy all you need. Easy to cook, prep food, and entertain guests in the living room and dining areas. Summer Stay Amenity Badges Include 3 Outdoor Pools! It was very nice. Having to bring your own linens was surprising especially for the price. The property was nice. I loved the big windows of the house. Our children loved it too. I would be careful with small children (4 years and under) upstairs because the steps are steep and the railing is low. It was great for our older kids and there was plenty of space. I did not like having to bring linens. It was especially confusing because the beds had sheets already on them. We arrived late at night with tired children and I did not like having to strip the beds and then put on our linens. It was inconvenient. It was another step at the end to put back on the original sheets before we left too. I have not experienced that anywhere else we’ve stayed and found it confusing especially with sheets already on the beds. I did not realize we needed linens until we were on the road so we had to buy some which added to the overall expense. Otherwise we enjoyed the house very much! What a wonderful place!!! Everything you need and more. Truly feels like home. No detail is spared or forgotten. Spacious well maintained, finely decorated, cozy cabin. The house is very well maintained and has everything one could want. We had a great time at this house. The location is excellent as it’s close to many fun things to do. We went to the casino, shopping outlets and Kalahari. This place is great for family fun.